Looking for something touchie – feelie to give this holiday season? 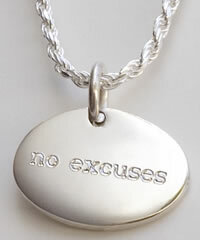 How about some affirmation type jewelry? I guess the 70s was supposed to be the me-me-me generation, but I would bet that the 21st century is edging in there too when it comes to fashion that makes a statement about ourselves. Such is the case for the jewelry over at Mirror Me. Along with t-shirts that proclaim: "focus" and "love yourself," you'll also find fun and funky jewelry of a similar theme. Sterling affirmation pendants are engraved on both sides. The affirmation is backwards on one side, and the other side the affirmation is forward. 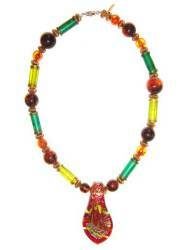 This gives the wearer the ability to reveal the affirmation either to themselves or to the world. It's available in the following phrases: "breathe; focus; love yourself; never settle; no excuses; respect yourself; and trust yourself." Remember me blogging about The World Jewelry Center not that long ago? Well, now it's official and in fact, October 25 was the deemed as "World Jewelry Center Day" in Las Vegas by some of the top political brass around those parts. Las Vegas mayor Oscar B. Goodman led an impressive array of distinguished officials and guests at a special event held here on Oct. 25, as plans for the World Jewelry Center (WJC) were announced by Probity International Corporation and the city. The WJC will be a focal point of the Las Vegas master-planned Union Park community, part of a major downtown revitalization effort. "We were thrilled with the warm and supportive red-carpet treatment extended by everyone, most notably Mayor Goodman, whose visionary leadership is transforming Las Vegas, as well as Nevada Governor-elect Jim Gibbons and his wife, Dawn, and the many city and county officials who attended the event," said Bill Boyajian, WJC managing director and former president of the Gemological Institute of America. Goodman presented a proclamation to Probity International Corporation President and CEO Robert Zarnegin and Boyajian, designating Oct. 25, 2006 as "World Jewelry Center Day" in Las Vegas. Goodman also gave Zarnegin and Boyajian a key to the city. "Probity International Corporation is one of the key partners who share the same goals and visions for the Downtown Las Vegas transformation," said Goodman. When I buy gifts for others, I love it when I am able to purchase an item that does double duty, like the Beadwork – both jewelry and houseware items – from Beads for Education. Buy purchasing beaded products from this non-profit organization, I get to buy a gorgeous beaded gift for a friend – and I have many who really appreciate hand-crafted beadwork – and at the same time my purchase makes a difference in others women's lives. The Dupoto Women's Group is a BEADS project now consisting of 25 women who produce high quality beaded dog collars, coasters, trivets, headbands, baskets and key fobs which are marketed by volunteers in the United States. All of the profit is returned to the women's collective. 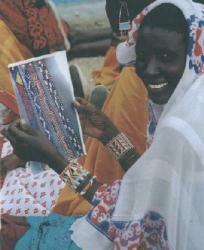 This is their primary source of income and these women support over 128 children (as of Sept '04). Due to their success, the Dupoto Women's Group has received funding from USAID and has been selected as a role model for other women's groups in Kenya. Okay, now for some beadwork eye-candy! I purchased one of the key chains for myself, so I can vouch for the quality of the beadwork. I'm always getting compliments on it too. To view these and more jewelry on their site, just look at the bottom of their page for a link to "products." Is the big turn to bling on the way out? Is this jewelry trend seeing its final days on the red carpet? I agree that the word "bling" is over used, but I am not sure if the idea of bling is going to be totally gone any time soon. When Bergdorf Goodman's holiday gift catalog returned from the printer last month, it was already out of date. 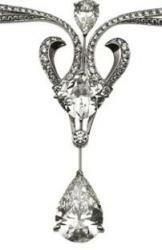 The 89-carat diamond cocktail ring on page 32 had gone to a buyer in Beverly Hills, California, for $100,000. Costly by any reckoning, the diamond was memorable both for its size and for its utter rawness: it had been neither cut nor polished. "It was a slate-gray, black and silvery stone," said Anjanette Clisura, president of the New York-based company Diamond in the Rough. "We didn't touch it, except to wash the dirt off." Clisura's company sells a line of uncut diamonds colored naturally in tones of cognac, blue, pink, yellow, white and green, wrapped in delicate threads of diamond pavÃ© and set in 18-carat white gold. Since introducing the collection to customers in Las Vegas in June, during the jewelry industry's biggest buying week, the response from retailers in New York, Shanghai and Sardinia has been overwhelming, Clisura said. [...] "At the moment, there's a move towards softer, more reassuring, tactile products and jewelry based on heritage, meticulous craftsmanship; something with symbolism behind it. Let's face it: We all love diamonds. That's not going to change. But the emphasis on how they're worn will." [...] "I haven't seen a return to huge diamond pieces," said the jewelry designer Suzy Fabrikant, co-owner of M. Fabrikant & Sons, a manufacturer of diamond and gemstone jewelry with operations in 11 countries. "Women's tastes are maturing, too. They want a ring that expresses more of them than just 'I'm rich.'" A new generation of jewelers is prepared to honor those wishes. Red is a favorite holiday color right now, so if you're looking for rich reds to go with your holiday wardrobe, consider garnet. Most garnet jewelry is affordable, especially when compared to other red stones like rubies, and look great with fall clothing. 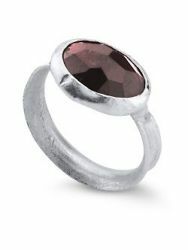 This gemstone can range in color from the more orange-ie color to deep dark burgundy. Pictured left is a sterling and garnet ring from JJill.com: A genuine faceted garnet gemstone is handset in a matte sterling silver bezel. Earrings: A trio of faceted garnet gemstones on a sterling silver French wire. Necklace: A wire-wrapped coin pearl is accented with a faceted garnet drop and strung on a leather cord. 16" long plus a 2" extender. Silver-plated hardware. The length of a necklace can be crucial when you are putting together an outfit. For example, if you are wearing a shirt with a collar, you either want to go super short – such as choker length – or super long – such as opera length. To help his customers select the most appropriate necklace length, jewelry designer Kenneth Fron has recently added a "Necklace Size Guide" on his web site. In this guide, he explains the different lengths, their names, their sizes, and how they are best worn. From Kenneth: I thought it would be helpful when selecting necklace's to purchase. If a necklace is a certain length on my Catalog, you can refer to the Necklace Size Guide to judge where the necklace might lay. I also carried over the Size Guide icon and necklace name categories to my Catalog descriptions to make a connection. For example; CHOKER, PRINCESS, MATINEE, etc. I hope you all had a wonderful holiday weekend. I'm sort of feeling like a beached wale today. But, the food fest is over at my house, and that means back to business as usual around here, including surfing around the blogosphere for you to find some cool jewelry and fashion advice. First up is FashionTribes who says black & white is always a smart choice. Fashiontribes shows how to copy a Viktor & Rolf tuxedo dress look on a budget…or not. 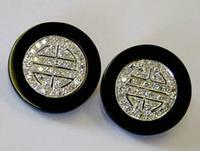 That includes these beautiful onyx and diamond cuff links. Beauty Buzz says we can smell delish with Jaqua Beauty's Coral Casino Collection with Pina Colada, Passionfruit Cocktail and Pink Champagne Products. YUMMY!! LA Story offers us podcast #6 with Joshua Radin as he rolls into LA. Stylehive's hot brand is Society for Rational Dress, Cerebrally Chic. Jewelry and Beading has been experimenting with paper clay. Sharp Lily discovered a beautiful gold plated locket necklace. Kristopher Dukes suggest "Arrow" Versace earrings as the gift to give to yourself. I saw some wonderful jewelry by Tracy Matthews profiled in the latest issue of Modern Jeweler magazine, so I had to do some surfing to find out more about this talented artist. I am very partial delicate designs because, for me, heavy jewelry is not that comfortable to wear on a day to day basis, and practical jewelry girl that I am, I like to have jewelry I just put on quickly and go and be comfortable all day. 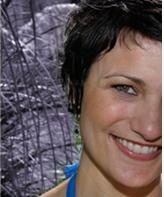 Matthews enrolled in her first jewelry fabrication class in her early 20s and discovered her creative path. By experimenting early on, combining color with metal, Matthews planted the seed for her future collections. Soon after, she was designing and selling her delicate jewelry to a succession of friends, families and bridal parties when she realized her first market. Her inspirations come from a collage of elements, including her yoga practice, spirituality, a love of color, nature, travel, and vintage jewelry. "I am fascinated by life in all its essence, and how the blending of fashion, art and culture melt together. I have always designed around a color story, and love pairing the uncommon," says Matthews. "My hope is that whoever owns my jewelry will treasure it for a long time." 14k gold pink vermeil moonbeams hover 2.25"
Laura Goldstein, of Mashu Mashu, announces her latest Vintage brass jewelry collection. Brass is a wonderful metal that over the years develops a patina that gives even new pieces an old feel. It's nice to a jewelry designer branch out and use vintage metals as well as a metal such as brass rather than stick with traditional materials such as silver and gold. Goldstein incorporates all kinds of other materials with this metal in her collection including stone, shells, and even velvet and silk. Here are a few pieces from her collection. The weather has finally turned a little chilly down here in Florida and that means time to pull out winter clothing. But what sort of gold and gemstone rings should one wear with turtlenecks and bulky black sweaters? Darkly elegant and evocative Diamond & Smokey Quartz ring. Elegant pear shaped Smokey Topaz gemstone with Diamond accents stands out on a 14kt two tone gold ring. (R6528) $450. Ring has 15 diamonds equaling .07 ctw. The warm chocolate of Smokey Topaz is conveyed stunningly in this 14kt white gold Diamond Ring. The ring features a Smokey Topaz stone with diamonds (R6531) $795.